Surfing can be a tough sport. Using the right paddle board for surfing can mean the difference between a great day of riding the wicked waves or eating them. There are a lot of paddle boards available on the market, and many of them are designed for a variety of purposes. We found most guides to offer all-around boards designed with a large deck space, stability, and leisure paddling in mind. However, surfing SUP boards are anything but that; they are designed for performance, trading off both deck space and stability for wide arc turns and maneuverability. Whether you are a beginner or not, using the ride paddle board can make your life much easier in the choppy waters or a difficult task for catching and riding the waves. In our guide, we look at the best 5 paddle boards designed for surfing. The ACE-TEC Performer is a 9-feet 2-inch epoxy composite with a foam core paddle board for surfing. 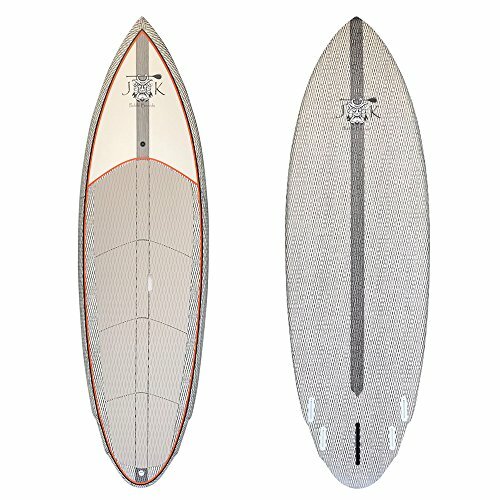 Great on flat water and small waves, the Performer is lightweight and durable for long-term use. It has a large deck pad for grip as you surf and a single center fin for tracking well. It also comes as a 10-feet 6-inch for people weighing 150 to 200 pounds and 11-feet 6-inch for people weighing 200 to 250 pounds. The ACE-TECH Performer is designed with a pointed nose with a rounded rocker to help catch and ride waves. It’s great for beginners and for more intermediates surfers, with an excellent no-slip traction pad that is soft on the feet (no chafing). If riders are looking for a longer board for surfing and for carrying a passenger (like paddling with your pet dog), then those options are also available. Single surfers should use the shortest board possible for the best control and performance. We also love the square tail. It gives the board a greater maneuverability and wider arc when turning. The Rico is a wood surfing board, that uses a 1″ thick diamond Kevlar weave wrap with a carbon fiber wrapped rails. It uses a quad fin set up, with a large center fin. The board weighs only 21 pounds, has an wide and long EVA deck pad, and a GoPro mount on the nose for capturing your best surfing maneuvers. The board is designed with a sharp nose and pulled-in tail to maximize responsiveness and maneuverability. The board is 9 feet long by 31 inches wide and 3 inches thick. If you want the strongest and most durable board, then the Rico is a suitable pick. Although it is a pricey choice, this board is designed to withstand the toughest of conditions while offering the best performance for surfers. The Kevlar weave gives the board a very hard and durable exoskeleton while allowing the board to flex like fiberglass boards. The carbon fiber rails protect the board from damage by bumping into terrain or from unintentional paddle strikes. The quad fins with center fin also offers paddlers maximum customizability for optimal surfing on many water conditions. The Double Wing is another well-designed surf SUP board with a 4+1 fin setup that is great for catching and riding waves. 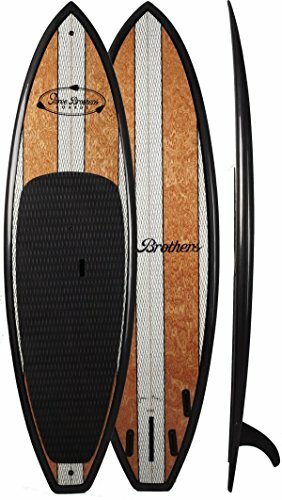 It’s great for reef and beach breaks, and can cruise flat water with ease. This hand-shaped and hand-finished board is 9-feet 2-inches long by 32 inches wide and 4.7-inch thick. It weighs 20 pounds and has a volume of 149 liters. The entire board is wrapped with carbon vector net. This somewhat pricey paddle board is worth its money when it comes to surfing. With a rounded rocker and high pointed nose, surfers will find this board perform with minimal drag and increased speeds. The carbon vector net also increases the strength of the board to withstand the impact of waves and terrain, making it less likely to snap in half. It provides flexibility and durability without making the board susceptible to breaking. The Tower Adventurer 2 is an inflatable paddle board that is 10-feet 4-inch in length, 32 inches wide, and 6 inches think. Although the board is not ideal for surfing waves, it makes for a great alternative for those interested in both learning how to paddleboard surf and enjoy their paddle boards for other activities, such as yoga or touring. The are made with PVC material with drop-stitch construction, making them durable and great for river paddling or other rough water sports. The Tower comes with a 3-PC fiberglass paddle, a manual air pump, a pressure gauge, a hand hold strap, and a roll-up carrying strap. It also has three fins, with the center fin removable for different surfing circumstances. What we like about the board is that it comes with everything you need to start paddling. The board is also made inflatable so you can deflate and inflate as needed. Safe storage is simple and carrying is easy. The board has a raised nosed that makes it great for catching on waves. There is also non-slip traction pad for both a comfortable and no-slip standing and a bungeed compartment for storing small equipments. The board’s thickness also helps maintain its shape to prevent it from bending during use. If you want to use an inflatable for surfing or learning how to paddle board surf, then this is a suitable choice. 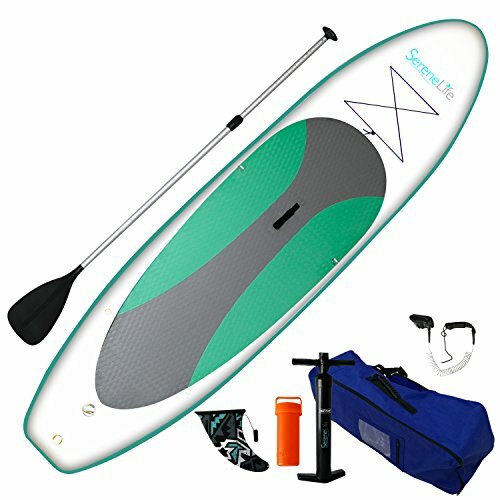 The SereneLife is one of the most popular inflatable paddle boards on the market. 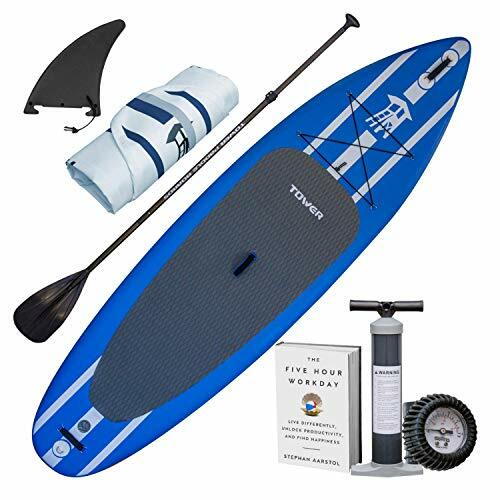 This iSUP is a 10-feet 5-inch long by 30-inch wide and 6-inch thick board that comes with every accessory you need to get started, including a paddle board, a pump, a center fin, a carry bag for storage and transport, and a coiled leash. The board has a traction pad nearly the entire deck top and a bungeed storage compartment in the front for carrying small items. This paddle board is not designed specifically for surfing, so it’s not the ideal choice. However, there are numerous reviewers who use this paddle board for surfing. It has a pulled-in tail that gives surfers maneuverability to make turns. The three-fin setup also helps track straight in the water. If you struggle with getting onto a wave as a beginner surfer, then this paddle board will be easier with greater stability and balance. It works great for small waves, it’s easy to inflate and start using, and it is durable and tough against rocks, logs, and other obstacles. You can use this board for other activities as well. 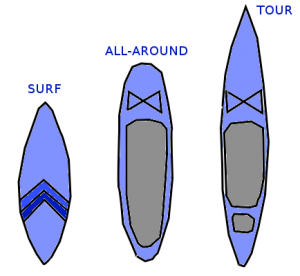 Surf paddle boards compared to the other two major types tend to be narrow and and short. The nose and sometimes the tail is pointy, which helps with hydrodynamics. Minimizing the length and width gives it minimal drag and maximum performance. Their design trades away stability levels, but gain in speed and maneuverability. You’ll need both to catch a wave and ride it as long as possible. Surf paddle boards also lack storage capacity (no bungee compartments). What Makes a Great Paddle Board for Surfing? Length: The shorter the board, the better control you have for surfing. There is less surface area to drag your paddle board when you catch and ride a wave. Nose: Noses should be pointed up. Higher noses makes it easier for you to catch and stay on top of waves. Fin setup: Customizable fin set up and quad fins are the best, but having three fins will beat one with better stability during turns. There are two things you need: a great paddle board, a proper leash, and a strong paddle. We already covered what makes a great surf SUP board, so let’s talk about the leashes and paddles. The Right Type of Leashes: We wrote an extensive guide on the best SUP leashes before. There are two main types of leash: coiled and straight. During calm quiet paddleboarding, a coiled leash is a great choice because it brings your board back to you when you fall off. The coil also prevents the leash from entangling your leg. This is different when you surf. The best leash for surfing are the straight ones. There is no recoil if you fall off the board so it won’t pull the board and hit you. Also, coiled leash tends to tangle around your paddle when you do fall off into a wave. When you choose a SUP leash, pick one that is as the same length as your paddle board, rounded up to the nearest feet. This will keep your safe from your board catching you in the head or the board fins from catching you in the chin. Ouch! Paddles with carbon blades is the best for paddling. They are lightweight, stiff, and often pricey. However, if you paddle frequently and intend to put your paddle to the test, then they are the way to go. You save on the expense of replacing your paddle and on the emotional disappointment of eating a wave. Paddles using fiberglass blades is another great choice for efficient paddling. The material is fairly stiff compared to carbon, but it is more affordable. When you pick a paddle for surfing, choose one with an offset of approximately 7 degrees. Paddles offset between 5 to 15 degrees. The less offset means more power behind each stroke, but this also depends on your stance and the angle you hold your paddle. Inflatable SUP boards are susceptible to instability from waves because they are lighter and have rounded rails. However, it is doable and can be really fun and challenging for both beginners and intermediate paddlers. Surfing can be a difficult yet rewarding sport. Learning how to surf can be difficult when you use the wrong board. That’s why we researched and put together this guide of the top 5 best paddle boards for surfing. Whether you are a beginner or an expert looking to replace your board, ultimately picking one that is short, with fins, and a pulled-in tail will give you the easiest means to catching and riding awesome waves. We hope this guide serves you well!